Indosole flip flops in sea salt. Approximately four years ago I was introduced to a practice called Nichiren Buddhism, wherein all the members pray for world peace. This practice works on the law of cause and effect –i.e. what you give, you get and what you sow, you reap! It included a lot of self-reflection and expressed that the only change one has to make, is to change you. Even though these changes were all very positive, it was difficult especially when I had to go out of my comfort zone. A year into the practice however, people around me seemed to notice an enormous change in me. I too, saw a dramatic difference not only in my life condition, but in the direction my life had taken. I decided to apply this Mystic Law to my work as well and help make the fashion world a better place in any way I could. It started with sustainability and going as eco-friendly as possible with my label. I started recycling everything I could lay my hands on, using it to accessorize and embellish my pieces. I then worked on the makeup and skin care products that I used. By writing and blogging about them, I developed a great review of a couple of brands I took along with me for my eco-friendly trip to Bali last month. Independent Fox sent me Cecil white slippers that I wore on the flight there. Apart from being lightweight, impermeable, anti-bacterial and anti-odor, they are also extremely comfortable and sturdy! Ethical, sustainable and eco-friendly are the brand’s core values. The upper part and the lining are made of a recyclable microfiber. These shoes are Chromium VI-free, are produced in a CO2-free manufacturing system and meet the requirements of OEKO-TEX®️ Standard 100. The outsole is also made of a recyclable rubber and the box that contains the shoes is made of recycled materials (the box has a handle so that you won’t need any additional bag to put them in). Their styles are minimal but very trendy! On reaching Bali, the sun was out and our villa had an amazing private plunge pool! I immediately switched into holiday mode and slipped on my new jumpsuit from Tom Foolery, LA. Being a designer myself, I love the cleverness of how the piece was cut. I was lucky to get two of the newest models of jumpsuits and it was a breeze putting it on. It is made as one long piece that you can wrap around you. Their fabric supplier, Thread International, collects plastic bottles from landfills in Port Au Prince, Haiti. Through a process of sorting, cleaning and flaking, they turn the plastic into jersey. The next day was a beach day and I couldn’t have been more enthusiastic as we headed to Jimbaran Bay. My sister and I both wore bikinis from Shapes in the Sand. P.S they also sent me a matching scrunchie! The swimwear is made from LYCRA® XTRA LIFETM containing ECONYL®, a fiber made using ghost nets and waste from the landfill. Made from recycled and sustainable Italian Lycra, they are handmade in limited numbers and have an exclusive hand-painted water-color textile print. I also took my Indosole flip flops, that were delivered to me right in Bali, out for a test run. I chose the sea salt color and they literally took the shape of my foot, so obviously took comfort to another level! The backstory is just so fascinating. The company understood that waste tires sit in stockyards, illegal dumping sites and even rivers. In tropical countries tires can become breeding grounds for mosquitos, which lead to awful diseases like malaria and dengue fever. Indosole repurposes these indestructible tires into the soles of some of the most durable footwear around. During my trip, I used ALL of my Coola products. Coola is a favorite of mine. Shortly after starting to use their products, I could tell how much I loved each one because the levels in the bottles started to decrease drastically. They sent me their sunscreen spray, SPF primer, SPF BB cream and tan line. I honestly can’t even pick one from these as each one felt amazing on my skin. Lily de Mai saves your skin from the damaging and aging effects of environmental stressors with Sanctuary Vita 3| Anti-Ox Defense Serum, a protective super fruit oil serum. Botanical vitamins and phytonutrients from organic Red Raspberry, Cranberry, Pomegranate, Rosehip and Seabuckthorn oils help to increase skin hydration, strength and firmness. The bottles of shower gel I received from Yope were definitely not travel size, however I couldn’t resist taking one with me after I tried it. My favorite was the Geranium. The natural geranium extract has antibacterial and soothing properties, which gave me a lot of positive energy! I love massages and Bodhi and birch have some beautiful body fragrances and face oils, which I went all out with during my massages in Bali. Pushing the boundaries of organic skincare, the much-anticipated Superfoods Series is essentially oil free and naturally aromatic, scented by the blends of raw ingredients. It also features high levels of omega 6, which leaves the skin supple, soft and with a fresh scent. Green tidings has the most travel friendly roll on deodorant. I liked the lavender fragrance one the most, but the unscented one has become a permanent fixture in my handbag for daily use. Even the brochure sent to me was printed with soy-based ink on recycled paper. Ayuna sent me the cutest travel pack with really tiny travel friendly products. It included a soap, balm, night cream and essence! Bio-tech cell cultures of turmeric, carrot, pomegranate, cotton and centella are combined with an enchanting beautiful cocktail of aromatherapy. Since Bali was a bachelorette celebration for both myself and my friend Alishya, we went to Mexicola- one of the popular Mexican restaurants that turns into a nightclub! I finally got a chance to wear my pieces from Jewellry by Juna. I received minimal, simple and geometric pieces inspired by the sun and moon. These are made from a combination of recycled sterling silver and when possible, Fair trade certified silver as well. I also used all of my TMF products. 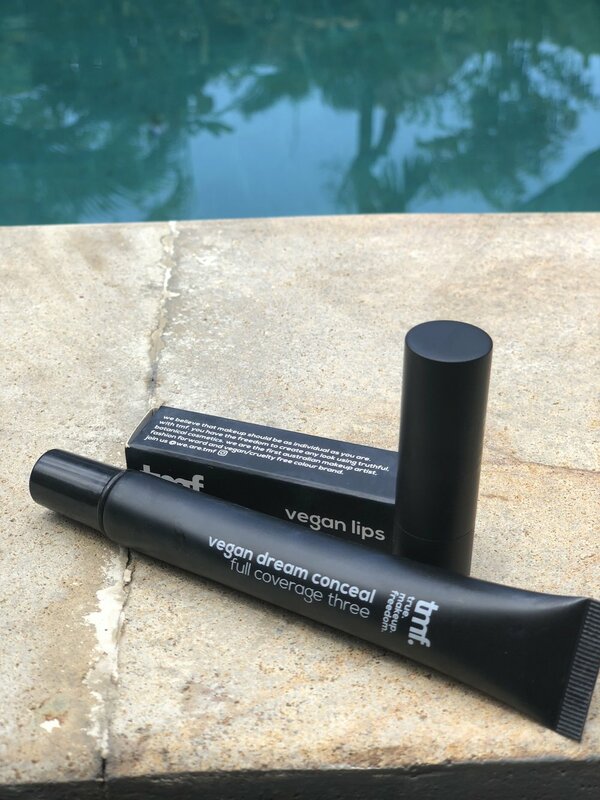 They sent me two of the hottest colors of their vegan lips, their dream conceal full coverage foundation and the vegan skin perfector liquid foundation- both of which have SPF. 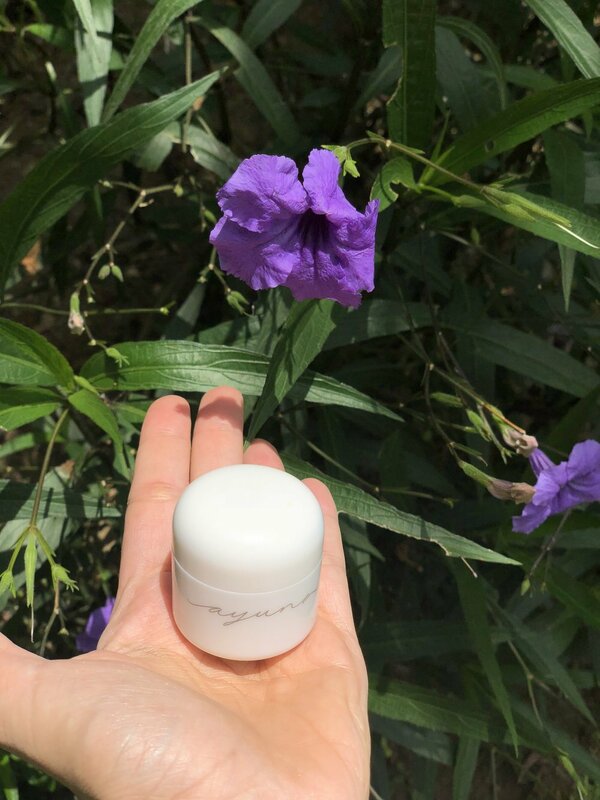 TMF is the first Australian makeup line that is high pigment, vegan and uses indigenous Australian botanicals that are so good for your skin! Bedtime also became an exciting time for me as Amaella sent me the cutest night suit. It is a mix between lingerie and traditional nightwear and I was extremely comfortable turning in for the night. By selecting the finest organic cotton, premium trims and pretty prints, they ensure your lingerie drawer is anything but ordinary. I absolutely loved the surprise cutout detail in the hips. I can’t wait to pack for another Eco-trip! Tell us what’s in your bag for your next sustainable trip!